Over the past few years, more than 100 female volunteers have joined their ranks. This article originally appeared on Women & Girls, and you can find the original here. For important news about women and girls around the world, you can sign up to the Women & Girls email list. SEVEN-YEAR-OLD MUHAMMAD WAS playing in his family’s garden in Kafr Zeta, a town near Hama, Syria, when he discovered an unexploded cluster bomb buried beneath the dirt and grass. The cluster bomb was small, and it resembled the type of ball that children in his neighborhood kick around the streets at playtime. It detonated as Muhammad held it in the palm of his hands. His arms, hands and legs were severely wounded by the flying projectiles released by the bomb. Aman al-Hassan,* a 40-year-old teacher and mother of four, was one of the first rescue workers on the scene. 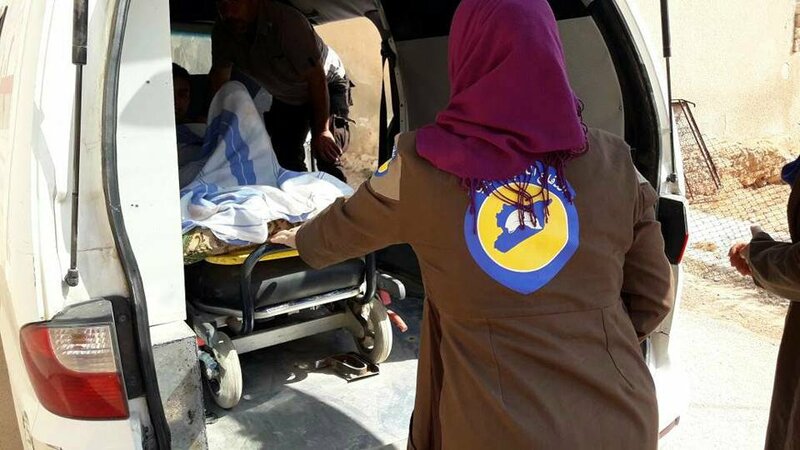 As a volunteer for the Syrian Civil Defense – also known as the White Helmets – al-Hassan is one of nine women who volunteer alongside men for the organization in Kafr Zeta. The White Helmets, nominated for a Nobel Peace Prize in 2016, were founded in 2012 and operate in rebel-held areas of Syria where volunteers rescue people from the rubble following government airstrikes. The group says it has saved more than 95,024 people. Until October 2014, the White Helmets consisted only of men. Since then, 140 women have joined the 3,000-strong volunteer group. 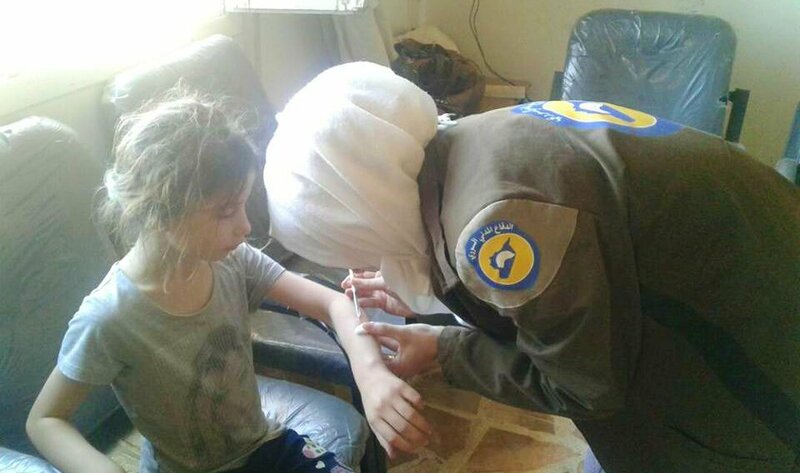 Al-Hassan joined the White Helmets in January to provide medical aid and assist the men’s team in rescue operations following bombings by government forces or by Russian planes, which she says can occur several times per day on bad days. Despite the constant fear, al-Hassan refuses to be one of the estimated 5 million Syrians who have become refugees after fleeing the violence in their home country. Women & Girls spoke with al-Hassan about her role as a volunteer. Women & Girls: Why did the White Helmets add women to their volunteer teams? Aman al-Hassan: This is related to the traditions and religion [of Syrians], because some women prefer to be rescued by women. Generally, when we are saving women, their clothes have been destroyed, and a woman wouldn’t want a man to rescue her or carry her like this. As a woman, I will approach her and this will make her feel relieved. Sometimes men will only want to be saved by men, too. But in most cases, it doesn’t matter – they just want to be saved. Women & Girls: Is the work that the women volunteers do different from that of the male volunteers? Al-Hassan: In general, the women focus on medical care and providing awareness to the public, while the men’s team focus on search-and-rescue from bombing sites and community services like repairing water lines [after they have been destroyed by bombings]. But when there is work to be done, such as evacuating civilians from a bombing site, we all work together. Women & Girls: How did people react when women joined the White Helmets? Al-Hassan: In the first week, people were amazed that women were being used as volunteers because they had never seen such a thing before. We made people aware that women could do this by first visiting injured civilians in their homes to provide medical care, such as changing their bandages. Then, when there was a bombing, they saw us rushing to help people. The mindsets of Syrians are changing because of our role. Society is now realizing that Syrian women can do anything and we can help with anything. Women & Girls: What type of training did you undergo? Al-Hassan: I did a period of training for about eight or nine months in a hospital where I learned nursing. Then I took an exam that consisted of medical questions, how to give first aid to all people and how to raise awareness among the public about first aid. All the women who [volunteer] are well trained: We can inject needles and do all different kinds of first aid. Women & Girls: What does your role as a volunteer consist of on a daily basis? Al-Hassan: We usually work from 8 a.m. until 5 p.m., with an hour-long break to eat lunch. We must work every day, because there is always someone to help. On [calmer] days, we teach the public about first aid. We raise awareness about how to behave when there is a bomb, and how to save yourself and those around you. We teach people that when a bombing happens, they need to be quiet to keep from scaring other people; we all have to calm each other. We also teach people that if a bombing happens when they are in public they need to protect their heads, and if it happens when they are at home then they need to take shelter in a room that has at least two or three floors above them. When there is a bombing, we all rush to provide medical care to the bombing site. We have a good amount of emergency equipment but there is a lack of medication, like antibiotics. If we had more, we could help more people. Women & Girls: How does your family feel about your volunteer role? Al-Hassan: My family is very happy, especially my mother and my father; my father always says, “I am proud that you are my daughter.” My husband is an ideal husband because he encourages me and he helps me around the house. This has a positive impact on my job and my success as a volunteer.